As quickly as $8 Lyft Lines replaced $5 Lyft Lines, they’re ending the more expensive promotion after just a couple weeks. On October 5th, Lyft discontinued their $5 Lyft Line promotion and increased their Lyft Line fares to $8. 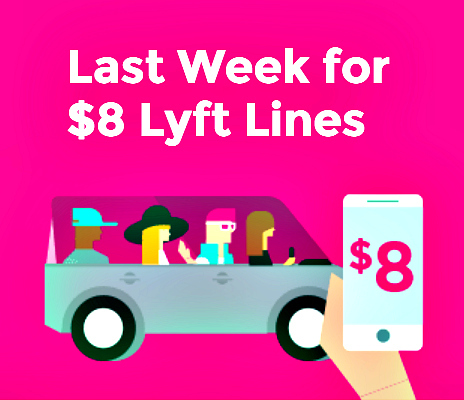 After less than a month of the eight-buck promotion, I received an email from Lyft saying that $8 Lines will end next Thursday, at least in New York City. But that isn’t the end of our discount zones. Starting 5 p.m. Oct. 29, we’re refreshing the zones with a new discount: Lyft Lines that are always 50% less than original Lyft. Thinking about this, the $8 Lyft Lines probably weren’t nearly as successful as the five-buck fares considering Lyft extended the $5 rides for months. I know I didn’t once use Lyft Line with the new $8 fare. That said, I doubt that Lyft Lines will ever get down to $5 fares again, so I’m interested to see what this “refreshed” promotion will be. The email mentions “50% off an original Lyft” in “discount zones” so it sounds like those of us living in dense areas of the city (what Lyft refers to as “hotspots”) are more likely to see the 50% discount. Lyft increases ‘Lyft Line’ fares to $8 in New York City Why you should take a Lyft (Line) from JFK to Manhattan How much does it cost to take a Lyft from San Francisco to SFO airport?